RALEIGH, NC (WTVD) -- It's a monumental day for N.C. State's Will Richardson as the redshirt junior offensive tackle has decided to forego his final year of eligibility and enter the 2018 NFL draft. The Burlington native is a second-team-All-ACC choice who played in 11 games this past season and did not allow a sack or a quarterback pressure. 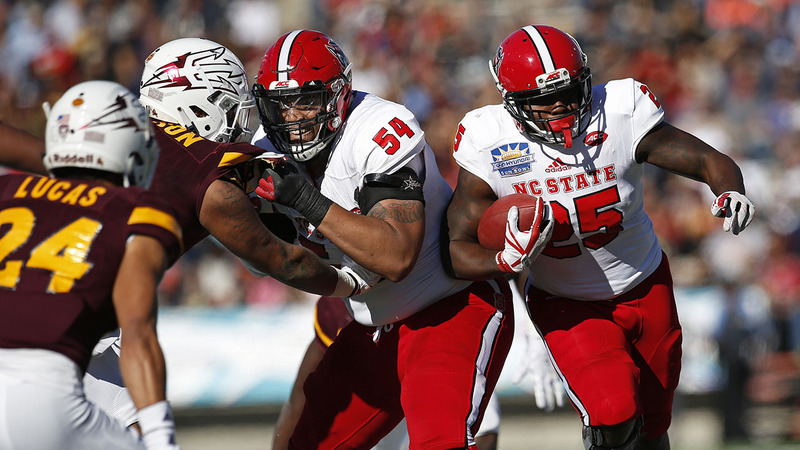 He led the offensive line that ranked third in the Power Five in sacks allowed with just 13 and helped pave the way for the Wolfpack's back-to-back 1,000 runners, Matthew Dayes in 2016 and Nyheim Hines - who also declared for the draft Friday - in 2017. "It's been great to watch Will grow as a person and as a player," said head coach Dave Doeren. "The 'Band of Brothers' is a special group and Will was an integral part of their success. Although we would love to have Will back for his senior season, we support his decision and wish him nothing but the best in his professional career." Richardson played every snap in N.C. State's eight conference games in 2017. "I'm so thankful to all my coaches and the staff here at NC State who have helped me grow on and off the field," said Richardson. "I will always be proud that I was one of the original Band of Brothers and my teammates will be my brothers for life. I want to especially thank Coach Doeren and Coach Ledford for their support." The school said that Richardson plans to return to N.C. State to finish his degree.